Woodhaven, a well appointed, newly remodeled one bedroom ski condominium. Sleeps 4. Free WiFi, firewood, and shuttle to ski area. No cleaning fees and no hassles! Woodhaven, 212 Yankee Girl Court, is a very well appointed 666 sq ft one bedroom condominium with views of the San Juan National forest from the living room, deck and master bedroom. This condominium has been completely remodeled with hardwood floors, doors and countertops. It sleeps four people. 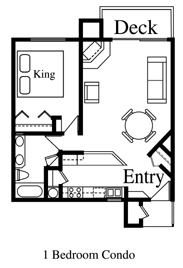 The master bedroom features a king bed and 27 inch TV. There is also a queen sized pullout couch in the living room. Linens, blankets and pillows are all provided. The custom kitchen includes a butcher block countertop and comes equipped with full sized appliances including a flat top range, microwave, icemaker and dishwasher and is completely stocked with pots, pans and dinnerware. Coffee, coffee fixings, salt and pepper, dish soap and hand soap are stocked as well. Be sure to read the kitchen inventory list at the bottom of the page. Trash is removed daily. The living room is furnished with a 27 inch TV, a DVD player and a wood burning fireplace. Firewood is available at the Country Store just down the road. The bath includes a pedestal sink, a washer and dryer and a custom tile steam shower. Towels and amenities are freshened daily. A sliding glass door leads out to the deck. Woodhaven, is an exceptionally nice place to pass a few days, weeks or months. It provides a range of convenience, views, and amenities that make it suitable for those who plan extended stays.